How to Build a Competitive Grocery App? When you think of grocery shopping, you probably think about a certain process: Making a list, driving to the grocery store, spending an hour or so wandering the aisles, then heading back home to unload the groceries. What if there was a different way to do this necessary task? Well, there is! Shopping with a grocery app is a trend hitting even the rural parts of the world. Being able to buy your groceries, or simply making a grocery list, while sitting in a meeting is an amazing convenience that people in a fast-paced society need. Time is precious so multitasking is a must. How is a competitive grocery app built? What key features does an app like that need? Before we can delve into building an app, we need to talk about what different types of grocery apps are out there (and how their features classify them). This kind of app allows the user to make and save grocery lists. Other features could be the ability to share lists with others, set reminders on default items (such as buying milk once a week), and updating lists in real time so others viewing them online will also see the changes. An app like this is extremely useful when your spouse or roommate is doing the grocery shopping but have no idea what to get. No more coming home with the wrong milk percentage! This type of app is growing in popularity by the day. Small, local businesses are now offering customers their time and wheels to shop and deliver groceries. This option helps not only the working-class but also the elderly/shut-ins who aren’t able to get out and grocery shop on their own. Grocery delivery apps run on subscriptions (usually per order, month, or year). So, in addition to selecting your products online, you can pay for your groceries and have them delivered right to your home. How awesome is that?! Calling all coupon clippers! There is now a type of grocery app that shows you what specific items you can get cash back on, then delivers that cash right back to you. Here’s how it works: In the rebate app, you select items on your shopping list that offer a discount/rebate. After you have completed your shopping, simply take a picture of your bill/receipt. Then, the app will analyze your purchases and deposit any money earned with the rebates into your app account. From there, you will “cash out” your savings and put that money back where it belongs…in your bank account! Have you ever been to a grocery store trying to decide whether to buy a product there or at another store where you think it might be cheaper? Anyone who has been grocery shopping and low on funds has experienced this dilemma. For a second-guessing shopper, nothing can be more useful than a price comparison app. This app does exactly what it says: It compares prices for a product at other stores in your area. But wait, that’s not all! It also provides up-to-date sales and promotional coupons for your favorite stores and notifies you of sales based upon your previous purchases. Where has this app been all our lives?! Large supermarket brands, such as Aussie Farmers Direct, Aldi, Food Lion, etc. now have their own apps. Each supermarket chain has an app that offers varying features. However, the most common features are shopping lists, discounts/coupons to scan at checkout, and (more recently) delivery. But, here’s the kicker: what makes these apps different from the ones mentioned above is that they restrict the user’s shopping to their particular brand/store. For example, if you are using a general grocery list app, you can add items from 3-4 different stores if needed. However, with a supermarket-specific grocery app, you can only add items from that one store. This works out beautifully if you only have one grocery store to shop at (like in a rural area). But as you explore grocery store options in a city-like area, you will find there are more stores/brands to choose from. Whew! There are quite a few types of grocery apps that many people don’t know about. 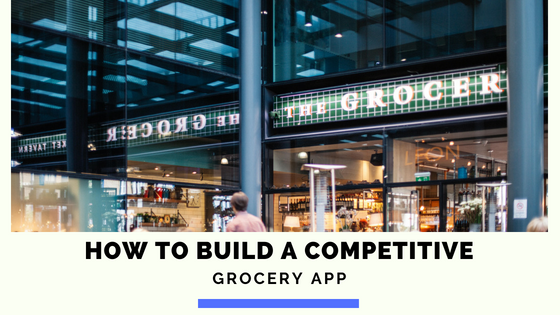 Now that you are “in the know,” let’s move on to building a competitive grocery app. And what better place to start than with its features! When you are building a grocery app, you need to provide the users with the feeling that they are physically grocery shopping at your store. This can be accomplished by presenting items with 3-D pictures of the products, adding products to a virtual cart, and searching products by name, category, etc. Everyone loves coupons! But let’s be honest: not everyone has the time to clip coupons. This is when digital coupons are hugely beneficial. You can look through the available coupons, select the ones you wish to use, then have them ready to scan upon checking out. Say goodbye to those scissors and hello to the digital coupon world. Customers have preferences that they like to save in apps or on websites. These preferences could be saving a username/password, only viewing certain brands, shopping at a specific location, and so on. The more personalization you can provide your customers, the more they will use your app. It’s almost the digital version of greeting a customer by name when he/she walks into your store. It’s true that new customers will sometimes forget about the grocery app they just downloaded. So, what’s a good way to remind them? Push notifications! Send them notifications about that new product you just put on the shelf, the sale you have happening right now, or the rebate they can receive when they purchase a product in your app. Engage your customers, then reward them for their efforts to shop with your app over all the others. To enhance the physical shopping experience, offer a bar-code scanning feature in your app. With this feature, customers can scan items they have at home to create a personalized shopping list that reflects current pricing. No more embarrassing moments at the store when you realize you are $1 short and there is a line of people waiting to check out behind you! Bar-code scanning can also be used while you are in the store to personalize a future shopping list, such as for an upcoming birthday party. Here’s the deal: Now that you know the types of grocery apps and what features are needed to develop one, you need to prepare for funding the development of such an app. With every app development, there will be variations. For instance, a grocery app for the Washington, D.C. area will look much different than a grocery app for the Nome, Alaska area. There are environmental and economic factors that will determine what features are needed for the target audiences. But, for our purposes, let’s talk about a general (or “universal”) grocery app. Now, with these features in mind, let’s assume that you are going to be paying an app development team $100 per hour. On average, the team will spend anywhere from 1,880 hours (minimum) to 2,470 hours (maximum) to build the app for both Android and IOS platforms. So, now you are looking at a total cost of $188K to $ 246K. Naturally, if you want the app to be on one platform and not the other, the cost will decrease. But, are these prices set in stone? Absolutely not. It will all depend upon what features you want your app to have, the level of quality you need to make a successful competitive grocery app, and who you hire as your development team (and the fees they charge). Costs are important when discussing an app’s development with the development team. Building a grocery app isn’t easy, but with the right development team, your idea can become realized without breaking the bank. It’s simple: A competitive grocery app is possible and the app development team at Gomeeki can make your idea a success. We know that developing an app can be intimidating, but we also know our way around this task. So, if you have an idea for an app that is needed in your area, please contact us. We believe in partnering with our clients to bring their dreams to life. Gomeeki is here to help you succeed in the fast-growing grocery app market. We understand that every business is unique and we have delivered mobile application development projects ranging from bespoke mobile applications to end-to-end strategy and execution for some of the most complex and data-intensive solutions in the market today.